After harvest, most fruits and vegetables release ethylene gas which is the aging hormone causing produce to ripen and ultimately spoil. so that ethylene and other damaging gases are removed. When used with refrigeration at correct temperature levels, PEAKfresh will extend the life and freshness of your produce. 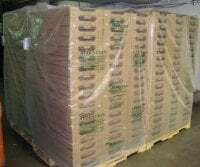 PEAKfresh home use bags are are made of the same material as our pallet covers and box liners which are used by growers and shippers worldwide for farm to store transport as well as storage. PEAKfresh products are OMRI listed for Organic Use (code: pfp-2278). USDA National Organic Program Rule (7 CFR Part 205). 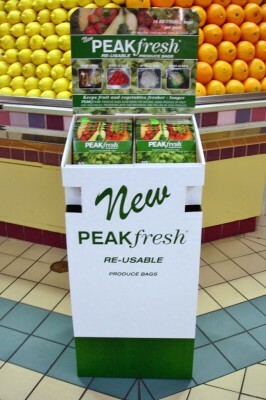 PEAKfresh produce bags are BPA-free and recyclable (Type 4 plastic). PEAKFRESH HOME USE PRODUCE BAGS NOW! 1. Important: pre-cool fruit & veggies in the refrigerator before storing in a PEAKfresh bag. 2. Use a separate bag for each type of produce. Note: Produce must be dry. 3. Expel air from the bag and close it using the enclosed twist ties and store in refrigerator. 5. Keep bags in their original packaging until ready for use. *Caution: keep bags away from fire and children. refrigerator for several hours before storage in PEAKfresh bags. 2. Produce should be fresh and undamaged. bag and then put in a PEAKfresh bag for added freshness. 4. Do not store whole pumpkins or onions in PEAKfresh. 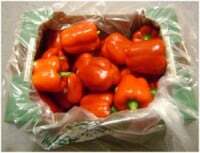 Differentiate your market and increase shopper satisfaction by offering PEAKfresh Produce Bags. 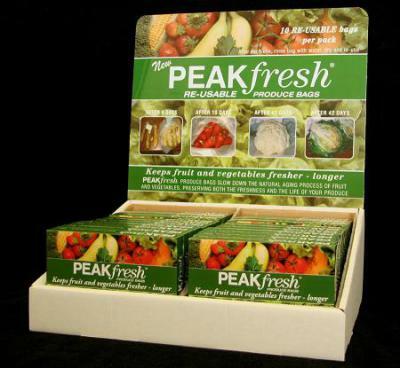 PEAKfresh produce bags are sold in individual packs that contain ten (10) re-usable bags. Minimum wholesale order is one Mastercase which contains 24 retail packs. First time orders of 2 mastercases come with free floor display or counter top display.